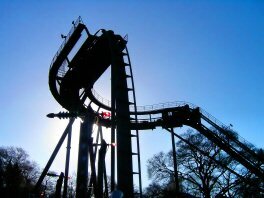 The construction of Oblivion was another undercover operation for the park. At the beginning of the 1997 season, all the rides at the bottom of Fantasy World had disappeared, and a large fence had been erected around the site from the exit of Black Hole, up to the Springfield Restaurant. During the season, work was being carried out on the site, and could be seen from the Black Hole exit. When I saw the site in 1997, all that could be seen was a very deep hole in the ground being reinforced with concrete. Rumours were rife on what Alton Towers new attraction was going to be. Nothing was certain, and the park was keeping very quiet about what the SW4, as it was known at the time, was going to be. All we did know was that they were advertising it as a 'World First Ride'. Once the track began to arrive towards the end of the season, it was obvious that this was going to be something very special. Many roller coaster enthusiasts across the globe identified the track as being B&M, though it was wider than the usual track. When the park closed for the winter, no one was any the wiser. Major rumours soon started that this was to be B&M's new prototype ride, the Dive Machine. The rumours were substantiated when some photographs identified the track further. It was confirmed by enthusiasts across the globe, that the new ride at Alton Towers was to be the world's first vertical drop roller coaster. But what is it like? The ride itself consists of several shuttles, each two rows of eight seats. The seats are slightly reclined, so when going up the steep lift hill, you are actually lying on your back. When you reach the top of the climb, and level off, you realise just how high you really are, as you see the Staffordshire countryside disappear into the distance. You might actually forget what you are about to experience. You slowly approach the drop, not really knowing what its going to feel like. Slowly you edge your way to the precipice, and are held for about four seconds at a forty-five degree angle looking down into the vapour filled hole. You might actually wonder if you really are brave enough. But, by the time the thought has entered your head, its too late, and the shuttle is plummeting towards the ground. You try to scream, but the terrific forces and roar of the ride drown you out. Accelerating all the way down, the track begins to curve away from the vertical, and begins to climb again, heading towards that small square of light. As soon as you are back at ground level, you are thrust into a sharp left hand bend which takes you up into the brake run.